I am running Firefox 63.0.1 (64-bit) and have the Add-on Norton Safe Web 3.1.0.9 enabled. Suddenly this is causing a problem when I try to download my website (created using Wordpress) for editing. 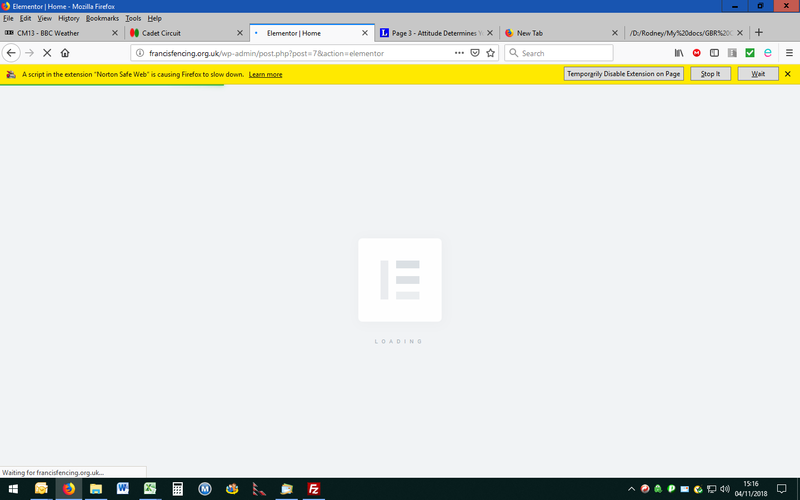 The whole download stops and a yellow bar appears at the top of the screen as shown on the attachment. Eventually it slowly grinds to download what is necessary. This was fine until recently and the website has not changed materially. Can anyone suggest how this might be fixed? A workaround is to disable the Add-on before downloading but that seems a bit excessive. I will notify someone from Norton about this issue. Please watch for a response from a Symantec Employee. Thanks for reporting in Norton Community Forums. Can you please provide website URL with script error issue? Thanks for the URL, @rodneyf. Issue occurs only when try to edit using Elementor in Wordpress and not while accessing page?